For most puppies, opening their eyes and taking those first tentative steps are important early achievements, but for Hero Dog nominee Noah, puppy development looked a little different. Born with deformed back legs and without eyes, Noah wasn’t exactly meeting his milestones when he was rescued from a backyard breeder by Saving K9 Lives Plus in California. 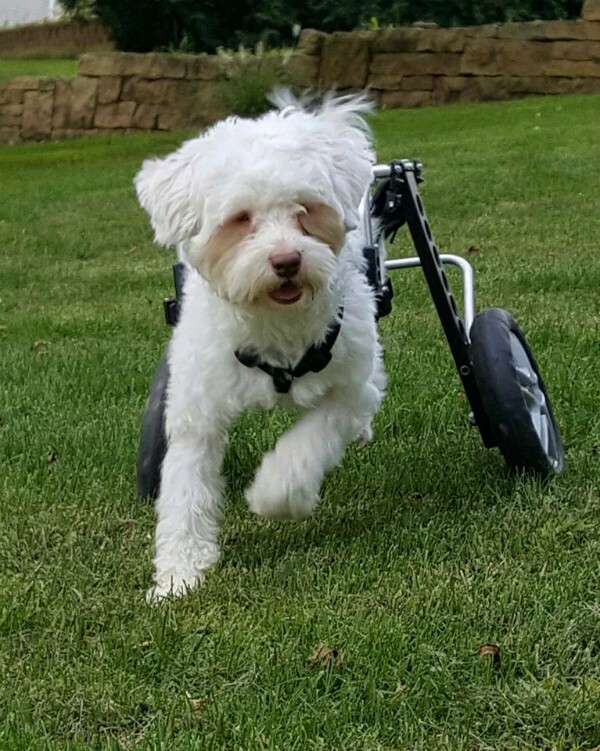 At 5 1/2 months old he weighed only 2 pounds, but thanks to the love of a whole army of dedicated dog lovers, Noah is now happy, healthy, and achieving more than anyone ever imagined. A powerful anti-bullying advocate and frequent guest in schools, Noah has taught hundreds of kids that physical differences don’t diminish someone’s capability. Edge credits a dedicated network of animal rescuers with helping Noah go from hopeless case to adorable hero. “It literally took a village to get him here,” she tells Dogster. One of eight puppies born to an inbred litter, Noah’s story could have ended very differently. According to Edge, Noah and his two sighted sisters, Mary and Abby, only made it out of backyard breeding when the breeder took one of their siblings to the vet. The dying pup unfortunately couldn’t be saved, and when medical staff asked if there were more puppies somewhere, Jasmin Gabay Kimball and Cinnamon Muhlbauer of Saving K9 Lives Plus got involved. Emaciated, matted and neglected, Noah and his sisters were happy to have help. “There’s no doubt in anyone’s mind that if Noah had not been cared for in the next day or two, he would have been the next [to die],” says Edge, who learned of his existence through social media. 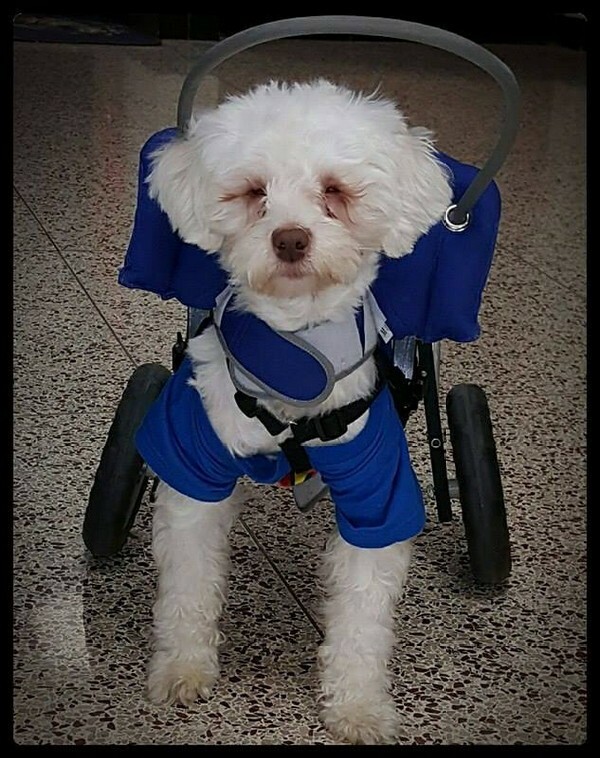 Experienced with special needs dogs — blind ones in particular — Edge had been looking for a new adoptee when she came across Noah’s picture online. Despite the distance, Saving K9 Lives Plus determined that Edge was indeed a good match for Noah. After spending months recovering in foster care, Noah was eventually ready to relocate to his new midwestern home. Edge is not comfortable on airplanes, but when a retired flight attendant heard Noah’s story, she volunteered to fly to L.A. and bring Noah back to his new family. “I don’t even know how many women have helped this dog,” Edge says. Despite his physical challenges, Noah felt comfortable in his new home right away, and instantly made friends with Edge’s two puppy mill survivors, Tater Tot and Lexi, who is also blind. Not long after he came to live with her, Edge decided to share Noah’s unbreakable spirit with the world and began taking him to nursing homes to visit with elderly patients. Word spread around her small community, and soon schools were calling. “The second you open up a door and he smells a school, he is in his element and he starts showing off,” says Edge, who helps Noah deliver a powerful lesson to students. “Don’t have sympathy — have empathy,” she tells the kids. According to Edge, children usually underestimate Noah when he wheels into a classroom. 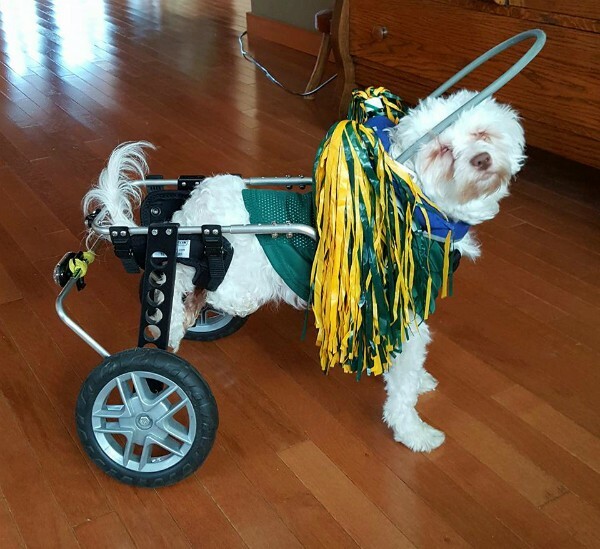 Sporting an anti-bump device known as Muffin’s Halo For Blind Dogs, and cruising around in a Ruff Rollin’ Wheelchair he got with help from fellow Monday Miracle dog Mango on a Mission, Noah looks very different from the dogs most kids are used to. It isn’t until he shows off his playful side that children stop feeling sorry for him and start feeling inspired. “He is absolutely as normal as any other dog, he just does things a little differently,” says Edge. To learn more about Noah, follow him on Facebook. The post Noah Escapes a Backyard Breeder to Find a Home and a Purpose appeared first on Dogster.